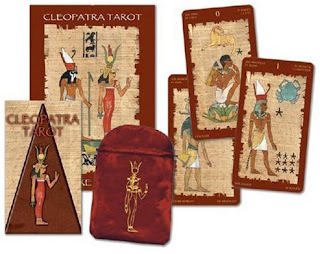 The Cleopatra Tarot Deck published by Lo Scarabeo. Cleopatra was a woman of of great beauty, intelligence and power. Not content to be Queen of Egypt, she started a relationship with Julius Caesar. When she bore him a son, Ptolemy Caesarione, it was her master plan that Ptolemy would be the Emperor of a combined Roman/Egyptian Empire. Unfortunately for her, the murder of Julius Caesar and the subsequent war put an end to that plan. Undaunted, and still after more power, she took up with Marc Antony, who was already married. Her plans were thwarted once again, when Marc Antony lost the war with Octavian. Cleopatra died not long after. It was during her time with Marc Antony that Cleopatra started to resurrect the Egyptian religion, and started promoting the ancient gods. 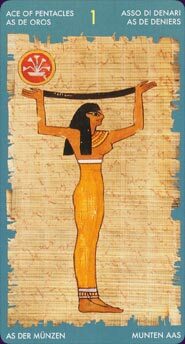 Egyptian astrology had started three centuries prior, but was brought back into consciousness through Cleopatra’s efforts. In the Temple of the Goddess Hathor at Denderah, carvings were found (and concluded to have been made during Cleopatra’s era). These carvings detailed the most complete documentation of the night sky. The carvings were so detailed that the zodiac signs were clearly visible, as were the five planets (all of which were placed in their signs of exaltation). It is on this basis that The Cleopatra Tarot was devised. Coincidentally, or not coincidentally, there were 78 Egyptian divinities, meaning each got their own card, and none were left out. 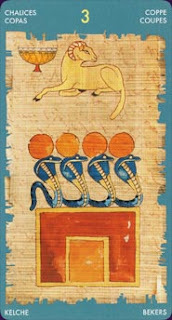 These are the 22 superior divinities, each of which had actions connected to the card on which they appear. Anubis was associated with mummification and the afterlife. In this deck, he is, obviously, chosen as the death card. 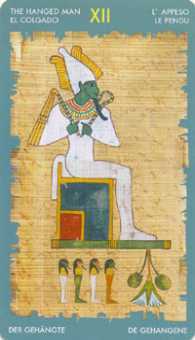 Osiris, god of death and the afterlife, was chosen as The Hanged Man. These are 16 divinities that had less range than the superior ones. Each suit uses the Knave, Knight, Queen, King approach. 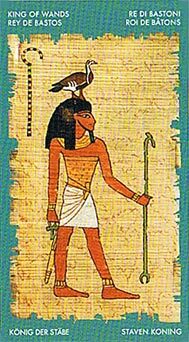 Geb is the God of the Earth, and was chosen for the King of Wands. The King of Wands is associated with life, creativity, and being a born leader. These are the 36 Doyens represented in the Temple carvings. These are also referred to as the “monthly spirits”. Senacher, known for nobility of mind and ability to command is the Three of Chalices, the card for trusting others and forming bonds. These are the three seasons of the Egyptian calendar, as well as the days of Sopedet. That is when Sirius ascends. The ascension of Sirius coincided with the time the Nile was just reaching its full benefits. Sopedet, as I just described, is used for the Ace of Pentacles, a card signifying reaching a goal, focusing on results. So, as you can see from this deck, the Egyptian astrology is incredibly well detailed and laid out for divination and exploration. In this spread, cards 1-3 are for Love, cards 4-6 are for Work, cards 7-9 are for Friendships/Social Relationships, and cards 10-12 are for Business and Finance. Based on the question the question the consultant asks, you only turn over the column that corresponds to the question, and ignore the rest. The top card is for the beginning, the middle for the evolution, and the bottom card is for the outcome. Among the pros, the artwork on these cards is amazing. There is interesting attention to detail. Images have inconsistent color, scratches, and dings. This was done, I assume, to make them look aged, more like carvings from long ago. For the suits, the accompanying booklet tells the planetary position associated with each card. So, serious astrologers can have a little more insight into the deck. Among the cons, since gods are used in place of traditional symbols, there is nothing to differentiate court cards from the rest of the suit, except that the suit cards have the numbers in the top center. Court cards are indistinguishable from each other, unless you read in the corners which card you are dealing with. A serious cultural faux pas on the part of the creator of this deck occurs when we are instructed to shuffle the cards 7 times, then have the consultant cut the deck with their left hand, after which the diviner shuffles another 7 times before dealing the spread. In Arabic cultures, the left hand is considered unclean. So to use the hand thought to be unclean in cutting a deck like this seems like a serious misfire on the part of the creator. Additionally, while Cleopatra may has resurrected interest in the gods, the gods and symbols used in this deck are all way before her time. The deck itself has nothing to do with Cleopatra herself, as these gods were not from her time. One would assume her name was attached to it for marketing value. Personally, I am a lover of unique decks with incredible art. This deck definitely has that. However, unless you are an expert in Egyptian deities and symbolism, this deck will have a most difficult learning curve. To me, that makes this set a wonderful set to add to a collection, for its artistic value. But, it also makes it a very tough deck to use for actual readings. Unless you are an Egyptian scholar, this deck will most likely be nothing more than a very beautifully drawn collector’s set. Visit Giani's shop on Etsy. I really like these posts about the Tarot. I've studied the Tarot only a bit, so I like reading about these different sets. Glad to hear you like them! We'll be doing more of them this fall!